DOCTOR WHO: Companion Pieces - LEELA | Warped Factor - Words in the Key of Geek. Tony Fyler takes a look back at Leela, and sees a prototype for companions who would follow. 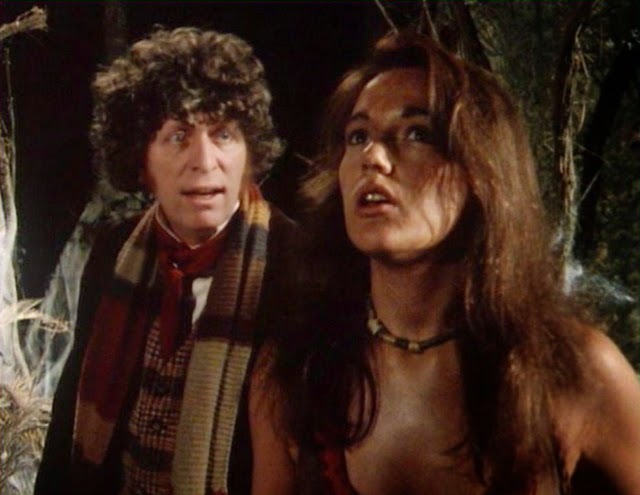 In many ways, Leela of the Sevateem was a massively unlikely companion for the super-intelligent Fourth Doctor to have taken around the universe. That she’s one of the most well-regarded and durable companions in the show’s history is down to some exceptional writing and showrunning, and even more, it’s down to the amazing performance of actress Louise Jameson. As a concept, Leela’s appeal is not hard to see – as Jameson herself has said, put a young woman in a leather leotard on just after the football results on a Saturday evening, and a nation of 70s dads are suddenly going to get interested in Doctor Who. But Leela was always going to be a harder circle to square than this. Yes, her physical presence and costume are there to bring in the dads, but on the other hand, Leela has to have a personality that balances warrior instincts with a relatively teenaged growth curve, an innocence about much of what the Doctor shows her, and a straightforward, black-and-white approach to the world, that sees what must be done and does it. That Leela the warrior-child delivers all this, as well as a degree of less philosophical, more practical feminism than the show had been used to, and still fulfills the companion’s primary role of being the way into the stories for the children who are their key audience is an ongoing tribute to Jameson’s skill and hard work as an actor. Louise Jameson was determined to get her face on the TV to bolster her CV in the 70s. She had got down to the final ten actresses considered for the role of Purdy in The New Avengers, for instance, and when Pennant Roberts cast her from over sixty potential Leelas, he did it, he said, because she “made him work” with her interpretation of the character. If the era of New Who has firmly established the idea that companions must earn their place alongside the Doctor, it’s an idea that had its first real flourish with the character of Leela. Long touted as the story of an Eliza Doolittle, reformed from her savage ways by the Doctor’s civilising influence, the story of Leela is actually more simple and universal than that. It’s the story of an angry teenager, forced by her encounters with good and evil to grow up. In many ways, Leela is the prototype for Ace, for Rose and for Amy Pond. When we first meet Leela, she’s on trial for heresy against the god of her tribe, Xoannon, and she quickly throws a mouthful of teen version rebellion at the sacred cows of the Sevateem – “There is no Xoannon!” she declares, to gasps from the Elders. If she has a bedroom at this point, it’s probably painted black and she could well have stormed off to it and slammed the door. But she quickly learns the price of rash words in the face of an implacable State – her own father dies supporting her, while she begs for his life, unsays her blasphemies, all just a little too late. Suddenly she’s an orphan, an outcast, and a child of the Evil One, alone in all the world. By the end of The Face of Evil, she’s joined forces with The Evil One, repaired a broken god, and brought the warring tribes of her planet together in a kind of ribald democracy. If we needed any further indication that she shares a spirit with the Doctor, she declines the chance for power and runs away. In fact, she asks the Doctor to take him with her, and he refuses. Leela, unwilling to take no for an answer, goes into the Tardis and sets it in motion. In essence, she steals a Tardis and runs away from her own people. Robots of Death also shows Leela the firebrand and Leela the hunter far more effectively than The Face of Evil does – her growl of “Try that again and I’ll cripple you!” showing the savage’s claws, and her reaction to being chased by a “creepy mechanical man” producing the immortal line “Please do not throw hands at me.” Leela the hunter also comes usefully to the fore when she recognises that Poul “moves like a hunter.” The Doctor may not have chosen her as his companion, but he recognises she is useful, and she determines to experience the universe he can show her, and expand her horizons. Many of Leela’s stories are among the best of Tom Baker’s era, without actually being particularly well-written from her character’s point of view. Talons of Weng-Chiang has much to recommend it but as a Leela story, perhaps its best element is the portrayal of her as a female Huckleberry Finn – trussed up in uncomfortable clothes as if for church on Sunday, eating with her knife and her teeth, and always ready to leap through a window and into adventure. Likewise, Horror of Fang Rock, the Edwardian base-under-siege story, is renowned for its introduction on-screen of the Rutans and its unparalleled bleakness, but for Leela it marks a turning-point – her warrior skills being useful in strategic terms, both defensively and offensively as the Rutan picks its way through the humans on the lighthouse. The Sun Makers is a cut above some of her other stories (The Invisible Enemy, Image of the Fendahl, The Underworld) being Robert Holmes firing on all satirical cylinders, and famously, Jameson’s favourite story of her run. Holmes gives Leela plenty of characterisation - comparing taxes to making sacrifices to tribal gods – and he also allows Leela to be Leela, taking a leading part in the taxation rebellion, but also showing her softer side, caring for the exhausted drone who would have thrown himself off a rooftop. Indeed in this story we see perhaps the first real hints of Leela developing as a person beyond her warrior roots. This development comes to a fruition of sorts in The Invasion of Time, where the Doctor she knows seems absent, replaced by a would-be tyrant-puppet. Leela though remains largely true to the spirit of the Doctor she knows, and takes a massively active part in the rebellion against the Vardan-Sontaran invasion, finding a surrogate tribe in the Shobogans and perhaps an equal in Chancellery Guardsman Andred. There’s little disguising that when Leela stays behind on Gallifrey to be with Andred, it leaves the viewer with a sense of “Really? Him?” but it’s important to keep the arc of Leela’s development in mind. She may not have mellowed as such, but she has learned both to pick her fights while with the Doctor, and to go about conducting them in the most effective ways. She has channelled her teenage rebellion and the pain of losing her father into productive ways to be in the universe. She doesn’t need the surrogate father of the Doctor any more. Her tribal instinct appears to tell her the time is right to stay. Leela of course has gone on to lives lived beyond the Doctor, in books and most particularly the Gallifrey series of Big Finish audios. It would spoil the surprise to delve into them here, but they show exactly how far Leela has come since travelling with the Doctor, and perhaps they paved the way for a whole raft of “After-The–Doctor” stories for other companions, particularly Sarah-Jane and Jo. They’re worth checking out for any Leela fans, or indeed Romana fans. Meanwhile, Louise Jameson, who first breathed life into the wide-eyed savage child and showed her evolution into a grown-up woman on a world that, like her own, had a tribe of wilderness-survivors and a tribe of technically advanced sophisticates, has gone on to buck the career trend of Doctor Who companions, with roles in other major UK shows including Bergerac, Tenko and Eastenders making her a star with many overlapping fan bases. It is a success richly deserved, as she has often, as she did with Leela, taken challenging characters, characters who shouldn’t work or shouldn’t appeal, made them live and breathe, and made them particularly memorable in British TV history.